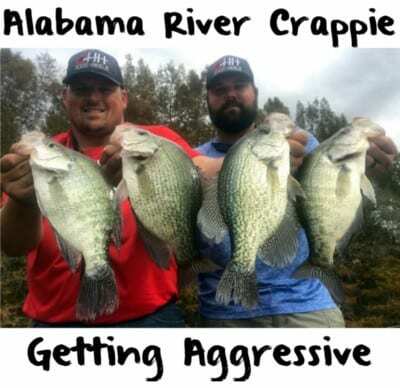 It’s crappie time on the Alabama River and the bite is good. The Alabama River holds some of the biggest fish in the state by far. A two-pound crappie here is pretty normal. It’s not uncommon to catch a fish like that. The average fish is probably going to weigh a pound-and-a-quarter and action is consistent. There’s a lot of big fish, but the numbers are usually good in late spring and summer, too. As good as the bite is now the best fishing on the Alabama River is yet to come. The bite is going to get better throughout the summer. 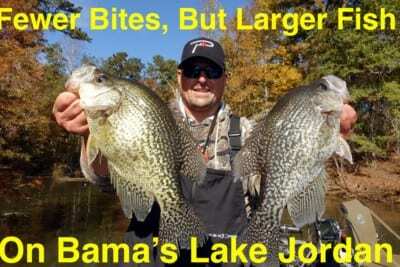 The area we fish is from Wetumpka all the way to Selma, but other areas on downriver hold crappie, too. The main river and all the creeks are harboring fish now. This is post spawn time, which means crappie are moving back to cover. The fish are coming back out of the shallows after spawning and when they do they feed aggressively. They’ll use the creek and river channels as highways to feed. Their pattern is consistent. They move from the shallows to deeper areas and pin tight to structure. 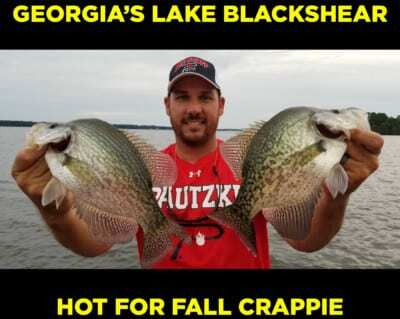 Basically, if you can find structure you’ll find crappie. Finding them won’t be tough. There will likely be 25 crappie on most structure. You want to look to any structure off the main creek and river channels. For example, you’ll find crappie on stumps, trees, rocks, etc. 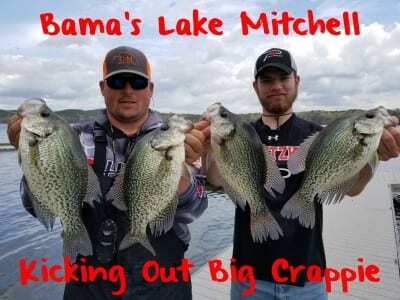 Usually crappie will be anywhere from eight to 15 feet deep and like we’ve been saying they’ll be tight to structure. One of the good things about the Alabama River is it offers a variety of ways to catch fish. Casting, spider rigging, trolling, vertical jigging and dock shooting works. I’m using live Chartreuse Fire Dye minnows fished on a Capps & Coleman double minnow rig. Last time we fished there we used Gold Fire Dye minnows, too. When spider rigging I’m using 6-8 pound test and when I’m casting we use 1/16 ounce Bobby Garland jigs tipped with a Fire Dye minnow. When trolling we use four-pound test with a combination of curly tail jigs tipped with Chartreuse Fire Dye minnows. When dock shooting we like a 1/32 ounce head with a Bobby Garland jig, but sometimes we use 1/16 ounce. Editor’s Note: Eric Cagle operates C&M Guide Service. 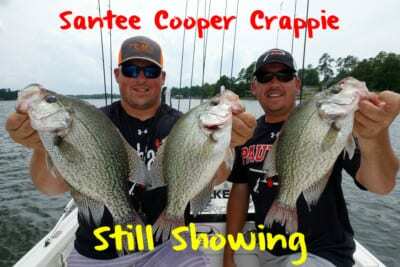 For more info on his Alabama River crappie trips please visit https://www.facebook.com/cagleandmcdonald.